In their struggle to crunch the Mercedes onslaught in the bud the Ferrari team in 1954 switched back and forth between their adapted 500 F2 machine, the 625, and the purposely built 2.5-litre 553. The latter one was faster but, let's say, more difficult, while the former was a trusted but slow proposition. Ironically, the one time Ferrari beat the Germans hands down was by using the 625 - unfavoured by the team, favoured by the drivers. It was a stunning repeat of the British GP victory Froilan González scored three years before, also at Silverstone. Not only did he nail it in similar fashion, he also performed another giant-killing act. This time Mercedes were on the receiving end rather than Alfa Romeo. The dress rehearsal for the Pampas Bull's majestic Silverstone triumph came two months earlier, in the International Trophy at the very same track. On that occasion González ditched the 553 used in the first heat, because its engine had locked solid, and went with Trintignant's 625 for the final, taking a commanding wet win. All through the season Ferrari dabbled with the 553 and 625 - and with several hybrids, also using the 735 sportscar engine. The original 625 was the former all-conquering Tipo 500 F2 car with an engine enlarged to 2.5 litres. The car was intended as an interim solution as the team looked to the 553 as their long-term prospect. Nicknamed Squalo because of its bulbous and untypical side-tanks, the car looked purposeful but it would never quite live up to the promise of its shark-like shape. In 2-litre form, the 553 had made its debut at the season-closing 1953 Italian GP, sportscar drivers Umberto Maglioli and Piero Carini racing two examples alongside the usual GP crew of Villoresi, Ascari, Farina and Hawthorn, thus forming a six-pronged Ferrari attack for the Monza race. The 553s faired reasonably well in qualifying but did not flatter their drivers during the race, Maglioli finishing eighth, 5 laps down. Carini retired halfway through the race. In Argentina, at the start of the 1954 season, Ferrari began its campaign with the 625, looking to accumulate as much points as possible now that they had the early going all to themselves, with both Mercedes-Benz and Lancia postponing their debuts to later in the season. Of course they still had Maserati to contend with and at Buenos Aires Fangio (waiting for his Mercedes seat to arrive) duly delivered for the tripod outfit. By himself he had outdone the entire Ferrari team since although Farina took pole and González fastest lap he still led three Ferraris home. Then, as could be expected, Ferrari won Syracuse with Farina, while González won at Bordeaux, both men driving a 625. The 553's debut would be at the International Trophy, and things looked good when González won his heat. But then his engine locked solid and he could not take the start of the final with it. Switching to Trintignant's 625, he waltzed the final all the same. His next win at Bari was also at the wheel of a 625, which by now had taken the comfortable amount of four wins. For Spa, Ferrari tentatively brought two 553s, for González and Farina. Hawthorn and Trintignant would still race 625s. The first Squalo, that of González, was out by lap 1, its engine having seized, while the second retired on lap 14 with ignition trouble. Meanwhile Fangio couldn't be bothered by Ferrari's woes and silently steered his 250F to another victory. On lap 20, González took over Hawthorn's 625 but could only manage fourth, trailing Moss and Trintignant in the second 625. The 625s had done it again while the 553 emphatically had not. This meant compromise time. For the Rouen GP, a week after Mercedes' long-awaited (and long-feared) arrival, a 553 cylinder head was joined to a 625 block using the 553's block dimensions, this hybrid engine put in one of the 625 chassis. Racing this 625-625/553 Hawthorn retired with a broken crankshaft, no doubt the result of the extra strain put on by the enlarged 625 block, while Trintignant made it five wins for the regular 625. At least it was a big improvement on the team's Reims form, that saw all 625s break their engines in vain pursuit of the flying German streamliners. By the time of the British GP, Ferrari had the reliability problems sorted and it was at the wheel of a 625-553 that González beat Mercedes. For the Nürburgring Ferrari introduced yet another variant, this time presenting a 553 head and bores mated with the bottom end of the 735 sportscar engine. In the resulting 625-553/735 González doggedly tracked Fangio's Mercedes for half the race but being overcome by emotion through the fatal practice crash of his friend Onofre Marimón he handed over to Hawthorn, himself having retired after 3 laps, who kept the car in second place until the finish. At the Bremgarten González surprised all by taking pole in the 625-553/735 but had to cede to Fangio in the race. After the encouraging German result Hawthorn and Trintignant were also on 625-553/735s but retired with broken engines. After a three-month absence a 553 was also sent on its way again, Umberto Maglioli driving, but a distant seventh was all the reward. For Monza Ascari rejoined the team in a one-off while waiting for the Lancia D50 to be completed and using another hybrid - a 625 with a 553 engine - nearly matched Fangio's qualifying time. Hawthorn meanwhile switched back to a Rouen-spec 625-625/553 and came home second, a lap down on Fangio. But the Mercedes driver didn't have a stroll to the finish, as Ascari gave him a fair run for his money, even leading the race at mid-distance before the 553 engine gave in. It was a sign that in fact Ferrari's cars and engines were on the pace but that its effort was diluted by the constant development in all directions bar the right one. With a touch more vision and straightforwardness Ferrari could have been a serious thorn in Mercedes' side, a view vindicated by Hawthorn's superb win at Pedralbes. The car with which he pulled that one off? The unfavoured Squalo, no less. Having won all but one rounds of the championship in 1953, Ferrari was to race two models in 1954 for the new 2.5-litre regulation. The very successful Tipo 500 was fitted with an engine enlarged to 2490 cc and was then called as the 625. This model was intended to be a stop-gap, with the car of the future being the Tipo 553, which, with a 2-litre engine, made its modest debut in the 1953 Italian Grand Prix. The car was nicknamed the Squalo because its bulbous side tanks gave it a clean and mean appearance. For 1954 Ascari and Villoresi joined Lancia and Mercedes-Benz had announced its come-back. Meanwhile the two teams didn't appear in the beginning of the season and the early races were between Ferrari and Maserati with Gordini leading the supporting cast of privateers and ex-F2 cars. Jose Froilan Gonzalez, nicknamed 'The Wild Bull of the Pampas' by the English, yet affectionately called 'El Cabezon' ('Fat Head') by his compatriots, switched to Ferrari to replace the two Italian aces. In fact it was only a come-back as all remembered his victory in the 1951 British Grand Prix at Silverstone when a Ferrari won his first World Championship Grand Prix. The car at that time was the non-supercharged 4.5-litre Ferrari 375 and the opposition which Gonzalez beat in a straight fight was his good friend Fangio in the Alfa Romeo 158. Arms flailing at the wheel, and with his vast bulk overhanging the cockpit sides, Gonzalez caught and passed the supercharged Italian rival machine and pulled steadily away to a momentous victory. The son of a Chevrolet dealer in Arrecifes, a provincial town about three hours' drive from Buenos Aires, he was a born on October 5th, 1922 and was a chubby baby who grew into a chubby man. Yet he was a keen athlete from a young age, a first-rate swimmer, a crack shot, a cyclist and a production car road racer just like Fangio. His father set him up in the trucking business, and by 1949 he was ready to join Fangio on their first European tour together. For the first couple of seasons his results were rather thin on the ground, his Maserati 4CLT/48 was outclassed in the Grande Epreuve. His best result was second at Albi in 1950 behind Rosier and his Talbot. When Mercedes resurrected a trio of pre-war two-stage supercharged W154 cars and shipped them to Argentina for a couple of formule libre races at the start of 1951, Gonzalez trounced them in both events in a supercharged 2-litre Ferrari 166. Back in Europe Gonzalez drove a Talbot and finished second in the Paris GP at Bagatelle. The luck of Gonzales was that the third driver of the Scuderia Ferrari, Piero Taruffi, was also the team manager of a motorcycling team which had kept him busy during the 1951 ACF GP at Reims. Taruffi was then replaced by Gonzalez in the Scuderia. Gonzalez had immediately the good pace but Ascari took over his car to finish second of the race. 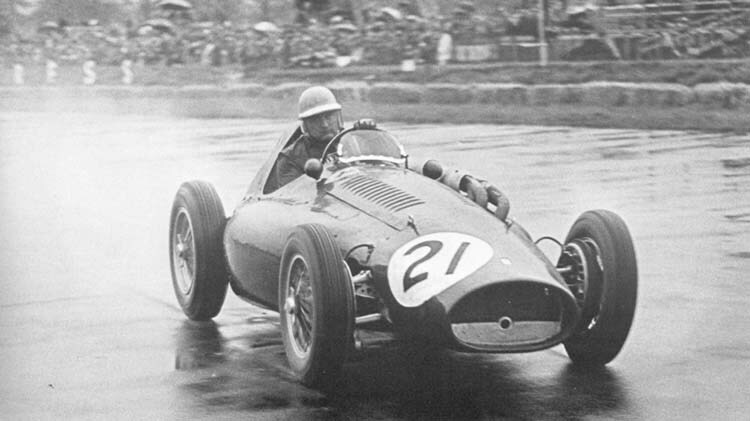 In Britain this newcomer gave Ferrari its first World Championship win and inflicted on Alfa Romeo its first defeat since early in 1946 (at Saint-Cloud). 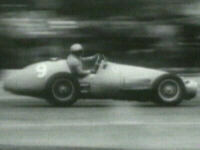 After another win at Bari (a non-championship event) and some good placings, Gonzalez finished third in the 1951 WC. In 1952, Gonzalez switched to the Maserati works team in time for the Italian Grand Prix, but he had a big shunt. He also drove the BRM V16 in some Formule libre and F1 races. He then did a full season for the team in 1953 before switching back to Ferrari in 1954 after Ascari and Villoresi has chosen to drive the new F1 Lancia D50. For his first 1954 F1 race at the wheel of a Ferrari, the Argentine GP, Gonzalez used the F2-derived 625 model and finished third behind Fangio and Farina. Two weeks later, in the Buenos-Aires City GP, Gonzalez was sick and Farina took over his car, finishing third. The first event of the European season was the Siracusa GP and proved a disaster for Ferrari and Gonzalez. His team-mate Hawthorn crashed his 625 into a wall and burst into flames. Gonzalez stopped to help him extinguish his clothing but his own car, the new 553, caught fire too and both cars were totally destroyed. Before the Belgian GP there were 4 minor F1 events. At Pau Gonzalez was eliminated when in the lead but won at Bordeaux with a 625. The 553, which would be reappeared at Silverstone during the first week-end of May. The picture we had to recognise was taken during the first qualifying heat of the International Daily Express Trophy at Silverstone. As it was usual at this event, the race was run in 2 heats and a final. Gonzalez won the first heat in the wet at 82.79 mph, while the winning time of Maurice Trintignant in his heat was 87.37 mph. Between the heats and the final the Ferrari 553 of Gonzalez broke down, with the result that he took over the 625 of Trintignant and his place on the front row of the grid. Trintignant in turn took over the 625 of Umberto Maglioli. Not surprisingly, Gonzalez gained an easy win with the 625 (#22), but it was subsequently alleged that the switch was made simply to give Gonzalez a more favourable position on the grid, and that the 553, which was supposed to have seized up, was started up after the event. At Bari Gonzalez won again with a 625. In the Belgian GP, Gonzalez - with a 553 model - started from the front row but retired at the end of the first lap with a broken oil pipe. Gonzalez later took over the 625 - with 553 engine - of Hawthorn and brought this car up into fourth place. At Rheims the Mercedes-Benz team re-entered GP racing and all the others makes would now have a very difficult time. Gonzalez used the 553 and the engine blew up inn a most spectacular manner. Meanwhile Fangio had won the first three rounds of the championship. On the Silverstone airfield circuit something changed. This slow circuit was well suited to the torque characteristics of the 4-cylinder Ferrari engines and the rather featureless corners made it difficult to line up the fully streamlined Mercedes-Benz. The two teams were now much more closely matched. Fangio was the fastest in practice but Gonzalez took the lead at the start and was unchallenged throughout the race. Fangio only finished fourth. The next Grande Epreuve was alas marred by the fatal crash of Marimon in practice. Fangio took the lead at the start from Gonzalez but the latter, upset over Marimon's death, gradually fell back and on the 16th lap handed over his 625 to Mike Hawthorn who finished second behind Fangio. In the Swiss Grand Prix, the Mercedes took the lead at the start, Karl Kling heading Fangio. The German driver, however, spun off on lap one, giving Gonzalez a second place which he retained at the finish. Gonzalez drove a 553 in the Italian GP and once again took over the car of one of his team-mate, Umberto Maglioli, and finished third. Sadly, Gonzalez crashed a sports Ferrari in practice for the Tourist Trophy and didn't appear in the last Grande Epreuve of the season, the Spanish GP at Pedralbes. This race saw the debut of the famous Lancia D50 but Ferrari who had only entered two cars for Hawthorn and Trintignant won the race thanks to Mike Hawthorn. Gonzalez took second place in the Driver's World Championship with 25 points and 1/7 to Fangio's 42. The F1 career of Gonzalez was nearly finished. From that time Gonzalez stayed in Argentina, taking part in his national Grand Prix until 1960. He only once raced a F1 car in Europa again, coming over for the 1956 British Grand Prix at Silverstone where his guest appearance in a Vanwall ended before it had began when a driveshaft joint broke on the startline. Gonzalez's final F1 outing came in a Ferrari Dino 246 in the 1960 Argentine Grand Prix at Buenos Aires where he finished tenth in a race which saw Cliff Allison's best placed sister car end up second to Bruce McLaren's winning Cooper.